2019 is the Year of Digital Transformation of Auto Finance. Are you Ready? At the recent Auto Finance Summit 2018 in Las Vegas, leaders from across the auto finance ecosystem declared unequivocally that the time has come for digital transformation within the industry. In a featured panel, BBVA, NMAC, TD Bank, and Wells Fargo leaders all recognized that technology will be a priority in 2019. With books of business ranging from $3 billion to $50 billion, that’s four of the nation’s largest lenders making a commitment to digital transformation. This signals to the industry that it should be a priority for auto originators and lenders to prepare for the new ways of doing business. If they don’t, they could be left out of the auto finance ecosystem. 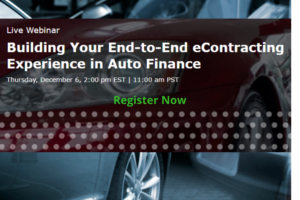 To better understand the technology landscape for auto finance, please join eOriginal and defi SOLUTIONS, two of the leading technology companies in auto finance, for a live webinar on Dec. 6 at 2 p.m. ET. Lana Johnson, COO of defi SOLUTIONS, and John Jacobs, Director of FinTech Strategies at eOriginal, will discuss digital best practices for eContracting. You will learn how auto originators and lenders can prioritize the building and expansion of the tech stack for an end-to-end digital auto financing process, from application to origination and then to asset monetization through warehouse financing or securitization. If you have not yet registered, we strongly recommend you do, as space is limited. We look forward to sharing additional insights on the digital auto revolution as it is sure to be an exciting 2019! About eOriginal: eOriginal guarantees trusted transactions of digital financial assets for all parties from the borrower to the secondary market. We create a ‘digital original’ document that combines all the legal and enforcement rights of a paper contract with the capital and operational efficiency of digitization. Our proven network provides the confidence, visibility and compliance lenders and buyers need by providing certainty in how these assets are maintained. About defi SOLUTIONS: defi SOLUTIONS provide a flexible, innovative loan origination software platform that gives auto lenders the tools they need to compete efficiently. By leveraging defi’s technology, lenders can increase applications and fund them faster. Their industry-leading, browser-based loan origination system (LOS) is completely configurable, quick to implement and provides actionable insights based on actual performance. Plus, they provide collection, analysis and custom reporting based on a lender’s origination data. This entry was posted in Auto Financing, News, Partners, Technology, Webinars and tagged Auto Finance.